Google's new social network, Google+, premiered Tuesday, promising a new spin on socializing online with a slick interface and a unique way of sharing content. The service launched to a limited number of users Tuesday in what Google is calling a "field trial." A few PCWorld staffers were lucky enough to be invited (it’ll roll out to everybody in the coming months), so naturally we jumped right into testing the new service. In general we thought the service borrowed some good ideas from the reigning king of social networks, Facebook, but also offers some cool new approaches to sharing content and managing privacy. In short, Google+ is a solid start to an incipient rival social networking platform that is sure to be enhanced rapidly over the coming months, and it could soon offer a solid alternative to Facebook. Now, let's dig in. Google+ has an easy set-up with almost no learning curve, especially if you're familiar with Facebook. If you’ve used any Google products before, you might be surprised at how much of that information gets automatically imported to your new Google+ account, to use in a social context. For example, I’ve uploaded pictures to Picasa without allowing others to view them. Google+ first asked me to select a profile picture from my Picasa Albums, and then gave me a choice: Either link my Google+ account with Picasa, or don’t join Google+ at all. One of the first things Google+ prompts you to do is select a profile picture. If you have a Picasa album, it’ll allow you to choose images from there. Either link Google+ to your Picasa pictures or you don’t use Google+ at all! 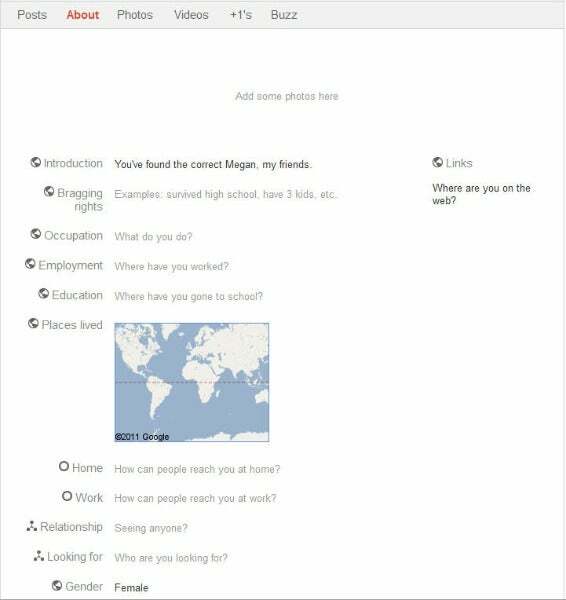 While Facebook profiles ask you the basic questions: gender, relationship status, religion, favorite movies, TV shows, music and so forth, Google+ asks you to make an introduction, like you’re back in the first day of your high school speech class, and then asks you to list “bragging rights” like “survived high school", "have three kids", etc. You can pin “places you’ve lived” on a Google map in the “About Me” section--a cool feature for globetrotters (or Army Brats). Google+ imports all of your information from Gmail automatically--and that means all. When you’re updating your friend circles there’s a tab towards the top of the page that says “Find and Invite”; click on it and you'll see a list of just about everyone you’ve ever sent an email to through Gmail alphabetically--even if the last time you sent them an email was four years ago. It's not surprising that Gmail remembers everyone you’ve every sent an email to--but it's a little jarring when all those names come rushing back at you at once. Now, how to organize all those people. Google claims to have done a radical rethink of the way social networks ought to work, so that they more closely mimic the way we organize our friends in real life. After using Google+ for just a few minutes I began to appreciate the simplicity of the "circles" approach. And I really like the way Google has represented it in graphical form in Google+: that is, you actually pick up people with your mouse and drag them into this circle or that. Nice job Google--it makes me think you’re finally getting a grip on this social thing after all. Google+ users can drag and drop their friends into the appropriate social circles. 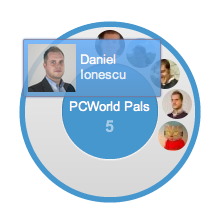 Here I'm dragging my colleague Daniel Ionescu into my &#34;PCWorld Pals&#34; circle. However, because this drag-and-drop function is behind the Circles tab, I began trying to add friends by searching for them from the Google+ homepage. When I would visit a potential friend's page and add them to one of my circles, it wasn't immediately apparent to them that we were now linked. I hope Google moves the Circles function to the front, making the process of forming connections a bit more user friendly. Google+ answers the call of many privacy activists to provide the functionality needed to set the privacy level on each piece of content shared. For instance, when I share an article or upload a camera image, Google+ gives me choices of which friend circles I’d like to share that content with. A picture from my phone might be perfectly fine for my Close Friends circle but very wrong for my Colleagues circle, for instance. For every piece of content you share on Google+ you're asked which circles or individuals should be able to see it. Still, I’m not sure that Google has given us the deep privacy controls that we might need. I’m not seeing the tool that lets me carefully fine-tune my sharing rules with a particular circle. I created a new circle for a new set of friends, but did not see where I could set the privacy settings for that group. Am I supposed to rely on the stock privacy settings Google has applied to the Friends, Family and Acquaintances circles it gave me to start with? The “Stream” section of Google+ is analogous to Facebook’s News Feed, and it does almost nothing different except for the fact that before you post anything, you have to decide which circles see it. You can make it available to “all circles” or even to “extended circles” where you basically email what you post to people who aren’t on Google+. The Stream function in Google+ is very similar to the News Feed in Facebook. Controls at the side of the page allow you to choose which of your circles of friends can contribute items to your stream. First, you click on the “Start a hangout” button, and it takes you to a separate webpage and enables your webcam and mic (while it's loading it even gives you a “fix your hair and make sure your mic works!” message, so you’re not taken by surprise). Then, you invite circles of friends, or individual friends to the Hangout room for the video chat session. You can create Hangouts of up to 10 people. One of the first ways Google will try to win users from Facebook is by leveraging the assets it already has. Search is, of course, Google's crown jewel. Where at Facebook you have to go wander around the web finding sharable content, Google+ brings the content to you. 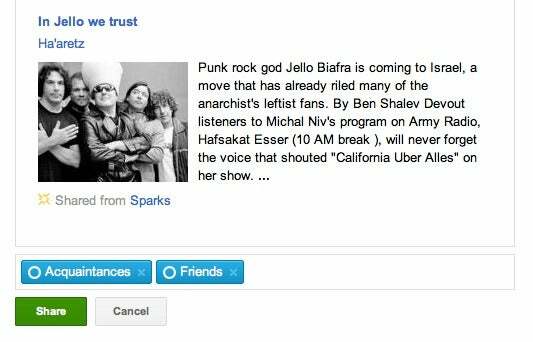 In the Spark section I entered one of my interests--punk rock--and the Google search algorithm brought back a bunch of mainstream media articles, YouTube and Vimeo video, and blog posts. After selecting an article about my friend Jello Biafra, I chose which of my 'circles' I wanted to share the content with. Firstly, the main Google+ Android app (available for free from the Android Market) does a nice job of bringing the core parts of Google+ to a mobile device. 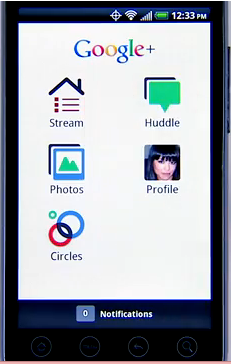 The app sports a simple home screen with icons for the Stream, Huddle, Photos, Profile and Circles sections of Google+ (see image). You can easily post notes and content, and comment on others’ shared materials, from the app's Stream screen. It also asks you if you want to attach your location to the posts you make. The Photos section shows you images shared by your friends, uploaded from your phone, stored in your albums, and photos of you shot by others and shared on Google+. A little camera icon in the top right corner brings you your camera app and lets you quickly post a picture to your “From Your Phone” album at Google+. I was a bit disappointed here, because Google made it sound as if photos taken from within the app were automatically sent to your Google+ album; but in truth you have push a "Done" button then go to another screen where you're asked if you want to attach a note or your geographic location to the photo. You have to go back into your album to designate which friend circles can see your photos. When you are reviewing your photos you can “tag” the people in them similar to the way you do in Facebook. You draw a little square around a person's face, then type in their name in the box below (or choose one of the names Google+ guesses) You can tag people who are Google+ users or just email contacts. Google makes it very clear that the information you contribute to the social graph underneath Google+ will be used to help refine search results and to help target web ads more accurately. While Google+ seems to put a lot of emphasis on giving users control over the way they share information with different circles of friends, it’s yet to be seen if Google will be more sensitive to the privacy of users when it determines which personal data is public--that is, available for use (in aggregate or otherwise) by Google and its advertisers--and which remains private. Google wants Google+ to rival its number-one arch-nemesis, Facebook--and by the looks of things the search giant may have a fighting chance. How will Google get people to move their online social lives away from Facebook and over to Google+? Google has already amassed a large body of user data search, Gmail, Picasa, Google Videos and YouTube, etc., but it needs the highly personal data that Facebook has been so successful at collecting. Google is said to have identified its social networking initiative as the company's central goal, and has the deep pockets to quickly build Google+ into a the kind of full-blown social networking platform that can challenge Facebook. Perhaps most importantly, expect Google to build Google+ features into the majority of its products from search to mail to video to documents. With all those great (free) services and now a tightly-integrated social networking platform under one roof, who needs Facebook? Had Google launched this strategy three years ago that may have been a good question. But the burning question now is whether or not Google is too late to the "social Web" to ever catch up.